UCC, KCCA rally Nakawa vendors to open war on plastics, e-waste. NAKAWA: As the world grapples with environment challenges including plastic pollution, the Uganda Communications Commission – UCC and Kampala Capital City Authority – KCCA on Tuesday launched a campaign against the use of plastics. 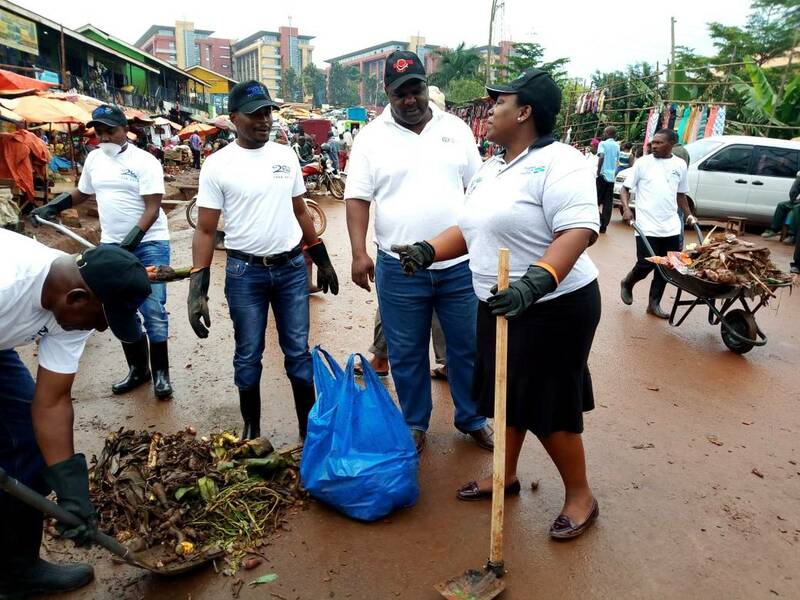 UCC staff in partnership with KCCA took the plastic pollution challenge to Nakawa Market where they carried out a cleaning exercise to raise awareness on the dangers of plastics and electronic wastes. Speaking during the cleaning exercise, Ms Pamela Ankunda, UCC’s head of public and international relations, said plastic and e-waste [electronic wastes] are a very big challenge to Uganda and the world. “You find some, I repair old fridges, computers but where do they go when they outlive their shelf life, what happens to them? We have come here to champion the struggle against plastics,” she said. “Our emphasis is creating awareness on dangers of electronic- waste which is in line with today’s Environment Day theme of “Beat Plastic Pollution,” she said cautioning Nakawa residents to embrace the exercise and reduce on the danger of plastics to the environment. Engineer Dickson Kwesiga, the supervisor of the recycling plant being constructed by government in Wakuku, Bugolobi, said UCC continues to demonstrate by putting the emphasis on the dangers of plastics and polythene bags among other non-decomposing wastes. He further recommended residents to always separate decomposing and non-decaying materials especially polythene bags and water bottles to help in reducing environment challenge. KCCA at the event unveiled plans of turning all non-decomposing wastes into an income generating activity to Ugandans. Ms Angella Ishimye, the KCCA Nakawa Division solid officer said the authority in partnership with Coca-Cola is setting collection centers in each of the 5 divisions in Kampala a bid to minimize plastic threats to the environment. UCC also donated cleaning materials which include wheel barrows, spades, and hoes among others to the market authority and asked traders to put the material to use on a daily basis. While receiving the denotations, Mr Charles Okui, the Nakawa Market chairman applauded UCC for choosing Nakawa as an example. He further revealed that his administration resolved that all traders will be participating in cleaning the once every month to make the place clean. “Once every month as a must each market vendor will have to clean their workplace. If the market is clean, even corporate buyers who have been running to supermarkets will start coming here and you are going to see the outcomes” okui said. In order to raise awareness on the increasing threats to environment caused by plastic, e-wastes among others , every year June 5 is celebrated as World Environment Day as has been designated by the United Nations – UN. The day also enables one to be more responsible in the way they conduct themselves and treat the environment. This year, the day is celebrated under the theme, “Beat Plastic Pollution” as way of reorganizing and finding solutions to increasing threats to the world environment and the eco-system.